Franziskaner Garten is located in the Trudering district in the east part of Munich. The beer garden as well as the cosy restaurant attracts not only guests from the neighbourhood but also bikers passing through the area. 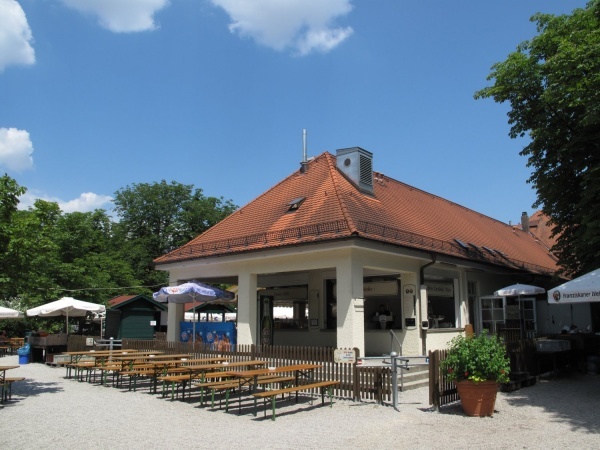 Following renovations in spring 2010, the Franziskaner Garten is under a new management. The beer garden has about 2,000 seats in the self-serviced area surrounding most of the building and 180 seats on a waitress served terrace. The beer garden is partly shaded by chestnut trees and sun-umbrellas. The food stalls offer traditional Bavarian meals and snacks, such as spare ribs, Hendl (roasted chicken) and Ochsenkotlett (ox chop). On sunny days, various types of fresh Steckerlfisch (grilled fish on a stick) are prepared on location. A highlight of Franziskaner Garten is the "Ochs' am Spieß" - an entire ox grilled on a rotating spear on special occasions. The Spaten Hell (lager) costs €7.70 p/Maß (July 2016) and is optionally served in a “frozen” beer mug. Major football tournaments are shown on up to three large public viewing screens placed throughout the beer garden. Depending on the weather the beer garden is open daily between 11am and 11pm.